Ok, so I know it’s April now, but someone should really tell that to Mother Nature. It has been cold, windy, and rainy here. So, I figured why not heat up the oven (and the house a bit) and enjoy some of our favorite comfort food. At our house, that means macaroni and cheese. I will admit that, out of laziness, it typically comes in the form of a blue and yellow box that is prepared in less than 10 minutes, but my favorite is actually to make it myself. 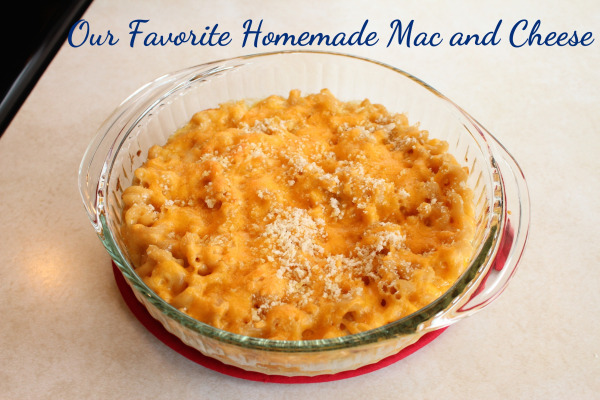 Macaroni and cheese is really a super simple dish to make and it tastes so much better when it doesn’t come from a box. There are a lot of macaroni and cheese recipes out there … and we’ve tried a bunch of them. This one is a pretty basic one, but it is, hands down, the winner as far as we are concerned. 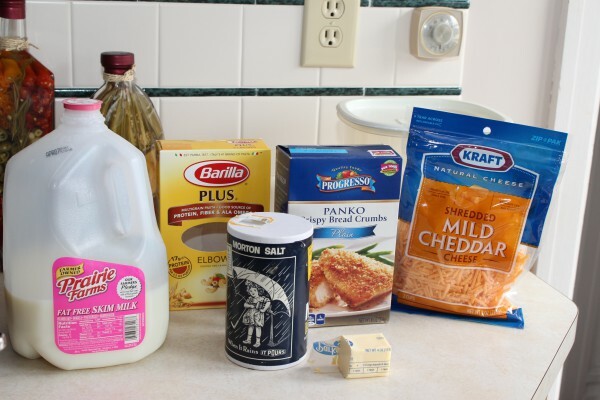 To make it, you’ll just need a few simple ingredients: margarine, flour, salt, milk, cheese, macaroni, and bread crumbs. One of my favorite things about this recipe is that we almost always have all of the ingredients in the house, so I never have to make a panicked trip to the grocery store when I figure out at 4:00 that we have nothing for dinner. Yet another reason this is one of our go-to meals. I start by preheating the oven and boiling a pan of water for the macaroni. 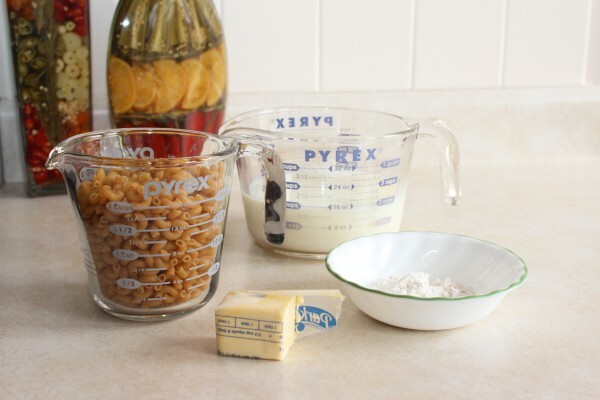 Then, I measure out all of the ingredients for the cheese sauce. There aren’t that many, but I find the sauce turns out better if I have everything ready to add as soon as it’s needed rather than hunting for a clean measuring cup when it’s time to add milk. Then, I melt the butter in a large sauce pan. 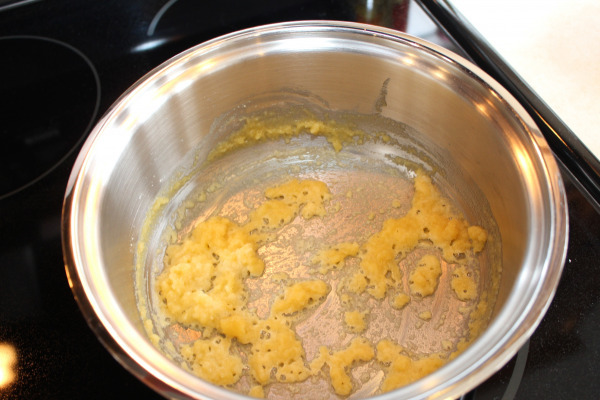 Once the butter is melted, I stir in the flour and salt and continue heating it until it’s bubbly. I usually let it bubble for a minute or two before adding the next ingredients – I feel like this helps the sauce to have a smoother texture when it’s all done. Next, I add the milk, just a little (probably about 1/2 cup) at a time, making sure to mix it in with the flour really thoroughly each time. I also usually wind up increasing the heat a little to medium-high at this point. I have an electric stove that doesn’t seem to run super hot, though, so I’m thinking the temperature might not need to be increased in all cases. Basically, I just raise it a little so it doesn’t take forever and a day for the milk to warm up and reach a boil. 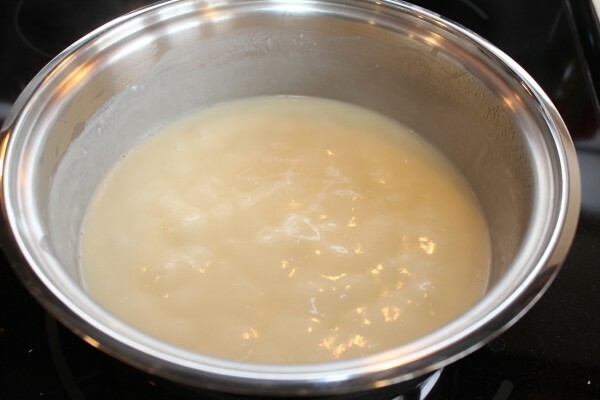 Once all of the milk has been added and thoroughly mixed in, I heat it to a boil and then reduce heat a little so it can simmer and thicken. It seems like this usually takes a few minutes (less than 5), but I just go based on the thickness of the sauce rather than time. Then, I add in the shredded cheddar cheese and stir until it’s both melted and thoroughly mixed in. By this point, the macaroni is usually done cooking, so I drain off the water and then add it to the cheese sauce, stirring to make sure the macaroni gets well coated. 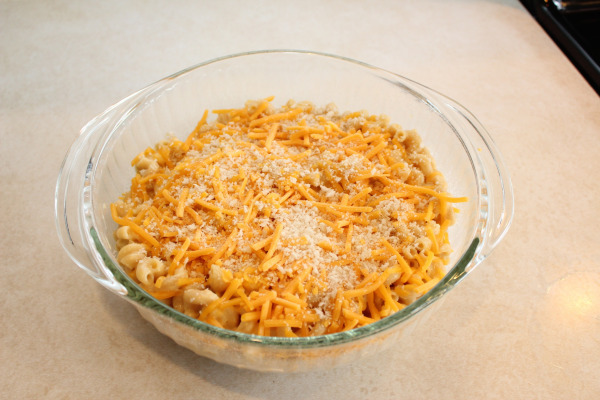 Next, I transfer the macaroni and cheese to a casserole dish that I’ve sprayed with a non-stick spray and top it with the remaining cheese (and usually a little more since we really like cheese) and bread crumbs. Then it goes in the oven to cook for 20-25 minutes until the cheese is melted and it’s heated through. I’ve also made this recipe ahead of time and refrigerated it until dinner. In that case, I just don’t add the breadcrumbs on the top before it goes in the refrigerator and I cook it for a little longer (maybe about 40 minutes), adding the bread crumbs when there are about 15-20 minutes remaining. Mmm … macaroni and cheese. We seriously love this dish, especially paired with green beans and fruit. 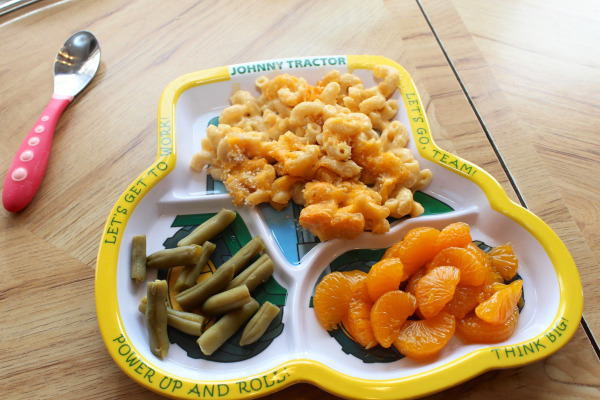 Haley thinks this is just about the perfect toddler food – and Chad and I gobble it up too. Can you tell we aren’t fancy eaters around here? 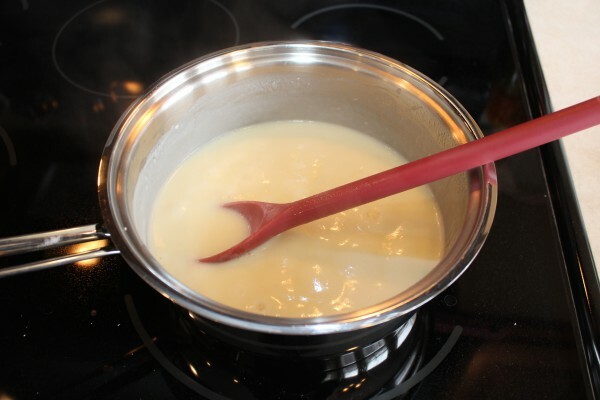 While macaroni is cooking, melt butter or margarine in a large sauce pan over medium heat. Stir in flour and salt and continue cooking/stirring until the mixture is bubbly. Slowly add milk (about 1/2 cup at a time), stirring thoroughly and heating to a boil after each addition. Simmer and stir the sauce constantly until it thickens (usually less than 5 minutes). 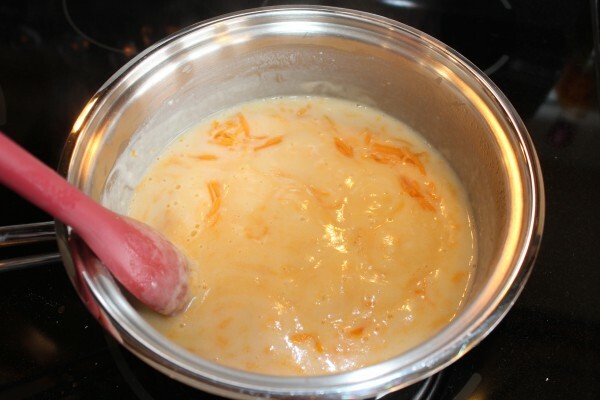 Add 1 1/2 cups shredded cheese, stirring until cheese is melted. 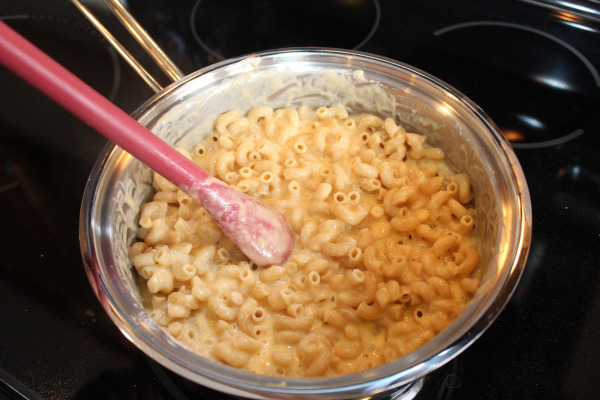 Add cooked macaroni to cheese sauce, stirring until the macaroni is evenly covered. Transfer to a 1 1/2 qt. baking dish sprayed with non-stick spray. Top with remaining 1/2 cup cheese and bread crumbs. Bake for 25 minutes or until cheese is melted and macaroni is heated through.